It's time for more mixed games here at the 2018 LAPC! Yesterday, players played three stud variants: Stud, Stud 8-or-Better, and Razz. Today, they are just playing the middle game. Players start with 10,000 in chips, and registration will be open until 4:30 PM. This is a one day event. Good luck all! It's time to kick off another flight here in this quarter million dollar guaranteed event here on the second week of action at the 2018 LAPC! Yesterday saw 239 players come out for the first flight, with 12 players moving on to the finals on Sunday. Today's flight will have registration open until 7:15 PM, and players will be allowed one re-entry in that time frame as well. Good luck everyone! The first flight of our $175 Turbo Double Stack Event drew 239 players. The top 30 players will finish in the money, all locking up at least $225. The top 12 players will be moving on to the finals on Sunday. Below you will see some of the players who came out for the first flight of the $250,000 Guaranteed Double Stack Turbo Event. Rubin Chappell is here fresh off of a deep run in last night's Event #1 finals. We also found Peter Hengsakul, David Rosenbloom, Benjamin Chung, and Nikhil Gera. The first mixed game event of the 2018 LAPC drew a total of 173 players, creating a prizepool of $51,035. The final 22 players will finish in the money this event, with a min cash earning $515. First place will be good for $12,270, and the Remington trophy. Scroll down for the full payouts. Nearly 3,500 people entered the opening event of the 2018 LA Poker Classic, a $350 buy-in event that posted a whopping $1 Million Guarantee. 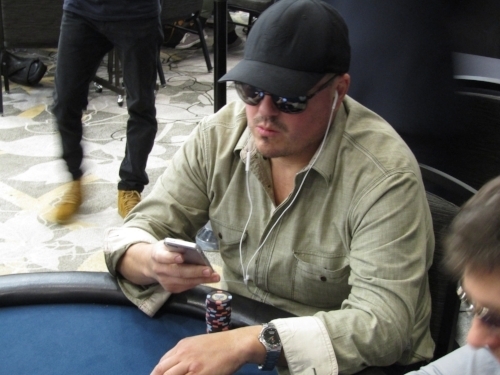 After a week of play, the dust settled with Northern Californian and part-time professional Chris Hinchcliffe finishing on top of a three way chop, earning over $142,000 for his efforts, the second biggest cash of his career, and biggest since 2004. “I feel outstanding. I’ve been heads up here at the LAPC twice and this time it was an ICM chop 3 handed I had 56 million of the 90 million in play and the short stack offered it. The other guy offered it, and I gotta work, so I’m happy for the win and ready to get back to work,” Hinchcliffe said after his victory. Hinchcliffe came into the final table fifth in chips of nine, but despite having the second most tournament earnings at the final table, he told us after his victory that he had been struggling with his confidence. Jonathan Khalifa started the final table as the chip leader, and extended that lead with a double knockout on the first hand. But from there, it was all Hinchcliffe, as he would eliminate three of the next four players on his way to a hefty three handed chip lead. The final three looked at an ICM chop, and agreed after moving some small numbers around. “I told my friends this morning was that I was going to approach it like single table satellite. I was going to approach it in the fashion of, I’m going to see what other people are doing, let them make their moves, and then apply pressure with my premium hands. And fortunately it worked out. I didn’t think it could happen until I got most of the chips and then I thought, we can play it out or chop either way I’m winning,” he said after the win. Hinchcliffe lives up in the Thunder Valley area, but was convinced by tournament director Justin Hammer to come down and play the Million Guaranteed, despite there being a $300,000 Guaranteed Event at his home casino. It turned out to be a good decision, and one that has changed his schedule for the rest of the series. Congratulations again to Chris Hinchcliffe on winning the opening event of the 2018 LAPC! For those who enjoyed the special big blind ante structure that this event used, you can look forward to seeing it again in most or all of the $1,100 No-Limit Hold’em Events. The mixed game specialists are out on full force today for the $350 Omaha 8-or-Better Event today, and you can see some of those players listed below. We spotted Brian Brubaker, who was the first of only two players to win a tournament at all four tournament series here at the Commerce Casino. 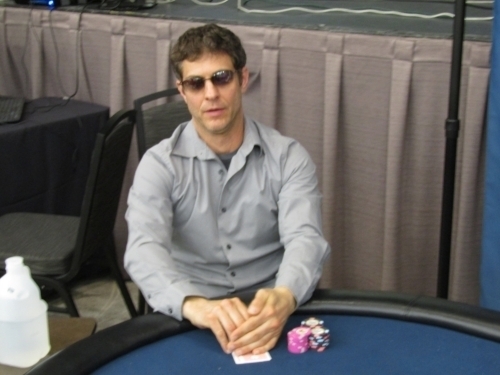 We also spotted Peter Neff, a former finalist of the LAPC Main Event. The final three players took a look at an ICM chop, and after some brief negotiations, a deal was struck. Chip leader Chris Hinchcliffe will take home $142,714, and his first Remington trophy, for his efforts. Jonathan Khalifa will earn an even $120,000, while Johnathan Blake will learn $89.845. Congratulations to all three players, but specifically our winner Chris Hinchcliffe, who earned his second biggest live score ever today. Jason Villard was able to triple up, but he was still left very short, and a few hands later, he was in a three way all in again. This time, it was between Jonathan Khalifa and Johnathan Blake, and they checked down to the river a board of [10c][10h][4h][7h][9h]. Khalifa fired 600,000, Blake folded, and Khalifa showed [Ah][6d] for the nut flush. The final three players are currently looking at an ICM chop. Congratulations to Benjamin Moon, Winner of Event #2! While the $1 Million Day 2 was playing out into the wee hours of the morning last night, Benjamin Moon was finishing on top of a six way chop in the $100,000 Guaranteed Bounty Event. For his efforts, Moon took home $11,800, and the first Remington of the series. Congratulations to Benjamin Moon, and scroll down for a full breakdown of the chop. We wanted to make sure that we kept you guys posted on the $350 Omaha 8-or-Better Event, which kicked off at 1 PM today. The 144 players who have entered are taking their first break of the day. Registration will be open until 5:30 PM today. This is a one day event, so come on down and try to win a Remington today! John Smith raised it up to 2 million, and on the button, Chris Hinchcliffe popped it up to six million. It folded around to Smith, who moved all in, a bet that was snap called by Hinchcliffe. Hinchcliffe was in great shape to rocket into the chip lead, and while the board gave him some sweats, it ended up being safe, coming down [10h][9c][3c][Kc][7s]. Here is how the final four players shape up right now. Jason Villard, who has held onto his final few big blinds for a while now, has laddered up to guarantee at least $55,650. After doubling up another player, Anthony Reategui was left with just a few big blinds, and he moved all in preflop. He was called by Chris Hinchcliffe and Jonathan Khalifa in the blinds, and they went three ways to a flop of [Jc][10s][8d]. Both players checked, and the [Ad] hit the turn. Hinchcliffe fired 600,000, Khalifa called, and the [3h] completed the board. Hinchcliffe thought for a bit, rechecked his cards, and moved all in. A frustrated Khalifa flashed an ace as he folded, but he was quickly relieved after Hinchcliffe tabled [Kh][Qh] for the nuts. Reategui showed a jack before heading to the rail in sixth. Chris Hinchcliffe limped in from the small blind, and Carl Hosten raised it up to 1.3 million, leaving himself about the same amount behind. Hinchcliffe assessed the situation for a bit, then moved all in, easily having Hosten covered. Hosten called, and the cards were flipped. Hosten was in great shape to double, but that all changed after the flop came 'Qs][9c][7c]. Hosten now needed a jack or ten, but the board finished out [3h] and [2s]. After a double elimination on the first hand where chip leader Jonathan Khalifa knocked out both Mitchell Halverson and Tim Tang, we are down to just seven players. Khalifa holds a massive chip lead with over 35 million now, with no one else having over 15 million. You can see the final seven below.